The Holy Martyr Theodore of Tyre was a soldier in the city of Alasium of the Pontine district (northeast province of Asia Minor, stretching alongside the coast of the Pontus Euxine, i.e. the Black Sea), under the command of a certain Brincus. They commanded him to offer sacrifice to idols. Saint Theodore firmly and in a loud voice confessed his faith in Christ the Saviour. The commander gave him several days to think it over, during which time Saint Theodore prayed intensely. They charged him with setting afire a pagan temple and threw him into prison for death by starvation. The Lord Jesus Christ appeared to him there, comforting and encouraging him. Brought again to the governor, Saint Theodore yet once more boldly and fearlessly confessed his faith, for which he was subjected to new torments and condemned to burning. The martyr Theodore without hesitation climbed onto the bon-fire and with prayer and laudation gave up his holy soul to God. This occurred in about the year 306 under the Roman emperor Gallerius (305-311). Unharmed by the fire, the body of Saint Theodore was buried in the city of Eukhaitakheia, not far from Amasium. His relics were afterwards transferred to Tsar'grad, to a church dedicated to his name. His head is situated in Italy, in the city of Gaeto. 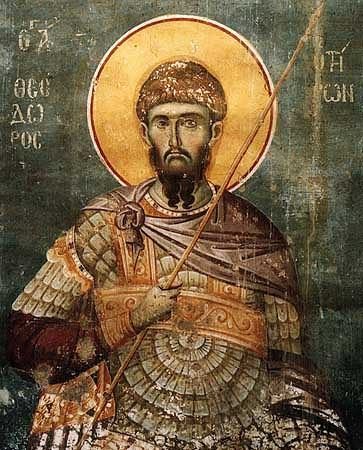 Later on, 50 years after the martyr's death of Saint Theodore, the emperor Julian the Apostate (361-363), wanting to commit an outrage upon the christians, commanded the city-commander of Constantinople during the first week of Great Lent to sprinkle all the food provisions in the market-places with the blood of idol-sacrifices. Saint Theodore, having appeared in a dream to archbishop Eudoxios, ordered him to inform all the christians, – that no one should buy anything at the market-places, but rather to eat cooked wheat with honey – kolivo ( kut'ya or sochivo). In memory of this occurrence the Orthodox Church annually makes celebration of the holy GreatMartyr Theodore of Tyre on Saturday of the first week of Great Lent. On the eve of Saturday, on Friday, in the Divine Liturgy of the Pre-Sanctified Gifts after the amvon prayer there is read the molieben-kanon to the holy GreatMartyr Theodore, compiled by the monk John Damascene. After this, kolivo is blessed and distributed to the faithful. The celebration to the GreatMartyr Theodore on Saturday of the first week of Great Lent was set by the Patriarch of Constantinople Nektarios (381-397).